In our continuing series of 47 films to see before you are murdered in your dreams we present King Hu’s wuxia classic A Touch of Zen. Gu (Shih Chun) is a well-meaning unambitious artist and scribe in a small town in China. There is a mystery around. Strangers in town. Yang, a girl with a knock you down stare (Hsu Feng) moves into the deserted house next door. Secrets of state,a power grab, injustice and fighting, but Gu still has to deal with his nagging mother and her ambitions for him to be a clerk. Influenced by the Sergio Leone westerns, King Hu’s Eastern begins as a languid affair, but once the action starts it quickly becomes a mesmerising spectacle. There are many weirdnesses about it. The way Gu for instance doesn’t fight and serves as a kind of mastermind/damsel in distress. It is Yang who is both the fighter and the rescuer. The way that the consequences of violence are dealt with as well. There is a moral, dare I say spiritual aspect to the film. 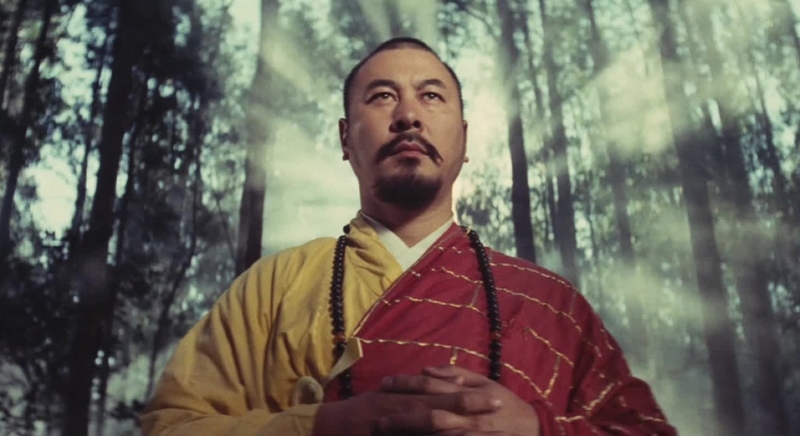 Roy Chiao as an almost invincible abbot of a community of fighting monks is a solid centre. A brilliantly charismatic turn. The film moves away from the village into a more mythical landscape of misty woods and mountain tops. Influencing hundreds of subsequent films – including Crouching Tiger Hidden Dragon, Touch of Zen is a touch of genius.